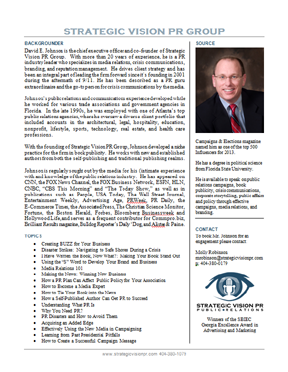 David E. Johnson is the CEO and founder of Strategic Vision PR Group. 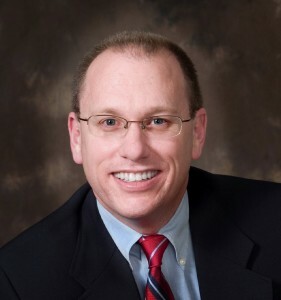 With over 20 years of experience, he is a PR industry leader who specializes in media relations, crisis, communications, branding, and reputation management. He drives client strategy and has been integral in leading the firm forward since its founding in 2001 during the aftermath of 9/11. He has been described as a PR guru extraordinaire and the go to person for crisis communications by the news media. Johnson’s public relations and communications experience developed with experience working for various trade associations and governmental agencies in Florida. In the late 1990s he was employed with one of Atlanta’s top public relations agencies where he oversaw a diverse client portfolio that included accounts in the architectural, legal hospitality, education, non-profit, lifestyle, sports, technology, real estate, and health care professions. With the founding of Strategic Vision PR Group, Johnson developed a niche practice for the firm in book publicity. He works with new and established authors from both the self-publishing and traditional publishing realm. Johnson is regularly sought out by the media for his intricate expertise and knowledge of the public relations industry. He has appeared on CNN, FOX News Channel, FOX Business Network, ESPN, CNBC, CBS This Morning, and the Today Show, as well as in publications such as People, USA Today, Wall Street Journal, Entertainment Weekly, PR Week, PR Daily, E-Commerce Times, Associated Press, Christian Science Monitor, Forbes, Bloomberg Businessweek, Hollywood Life, and serves as a frequent contributor for Commpro.biz, Brilliant Results Magazine, Bulldog Reporter’s Daily Dog, and Alister & Paine. He was named as one of the top 500 Influencers by Campaigns & Elections Magazine for 2013. Follow David E. Johnson on his blog.